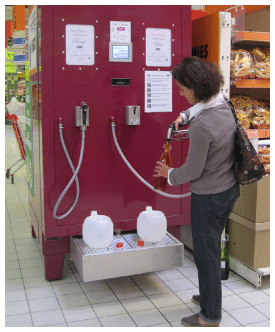 Some French supermarkets now house 500 and 1,000 liter tanks of wine and customers can fill up their own reusable bottles for about $2 per liter. The concept hearkens back to a bygone era when wine would arrive in Paris shops in barrel and consumers would bring their own flagons to fill. Founder Astrid Terzian says she started this scheme to fill a niche – environmental awareness and the economy. The elimination of packaging mass means that the wine can be shipped much more efficiently from a cost and carbon perspective. Regulations permitting, it’s possible that these wine filling stations could soon make their way to U.S. supermarkets. But not a chance in Canada. Isn’t there something like this in Quebec? I seem to remember friends from Montreal driving out to a sort of wine depot to fill up their own bottles. Actually, for a few years at least they offered this at LCBO store 1 (Weston Rd/401) in Toronto, trying to beat the Brew Your Own shops…. But they ended it. I guess it wasnt profitable enough. Actually this sort of wine filling station is ongoing in Nova Scotia Liquor stores (at least in Hfx.) and the prices are quite reasonable; don’t know if the quality is good or where the wine comes from.